We have all had items in our possession that needed to go into the trash. Many of us put these items into the trash where they go. Then there others. My boyfriend, the cute, kind, generous man that he is, is a pack rat in a bad way. He hates to throw things away that might have some life left. Yay me! He would laugh when I spent time “shopping” in his backyard. But, I have scored some cool things that did indeed have some life left in them. These items just needed some major resuscitation. One of these items was an old tool cart that had a rotted shelf on top and an air compressor on top. It was an eyesore and I begged him to get rid of it. I am so glad he didn’t! When I moved into my new house, I decided that I needed to add a small kitchen island. 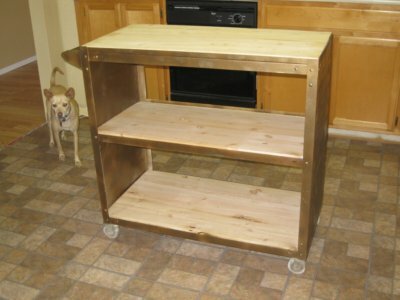 I looked at plans to build my own and I shopped for cheap stock kitchen cabinets. Then, I remembered the old eyesore! I snagged it and transformed it into something really great that gets so much use now. 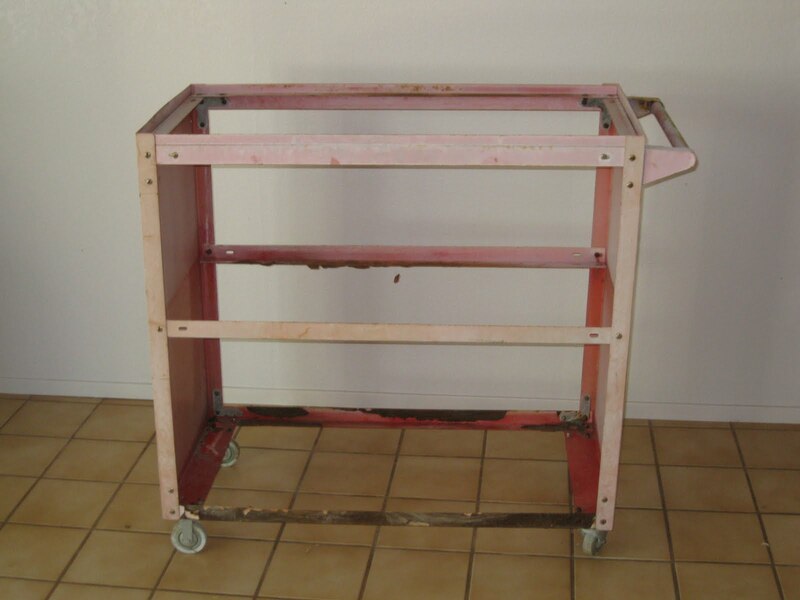 I peeled off as much loose paint as I could, then I sanded the cart using a fine sandpaper for metal surfaces. After sanding and carefully wiping the cart clean, I stalked the paint aisle of my local Home Depot. I chose a spray primer for metal and a beautiful Rustoleum spray color called Antique Bronze. Because this cart has large surface areas on the sides, I ended up spraying several coats so I could get good coverage with minimal mottling. I got some pine boards and cut them to fit the shelves. And, voila, my new kitchen island! Although I am using this cart as it is now, I think the pine boards look like they need something. 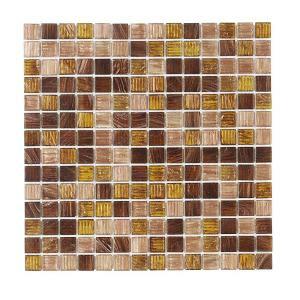 I am thinking of maybe tiling the shelves in these great glass tiles. As my boyfriend became more organized in his home I found it easier to score cool stuff! In later posts, I will show how I turned an old bunk bed ladder into a cool pot rack. BTW, that cute little dog in the picture is our dog, Sandy. She is a real ham and I am sure you will hear more about her :-).